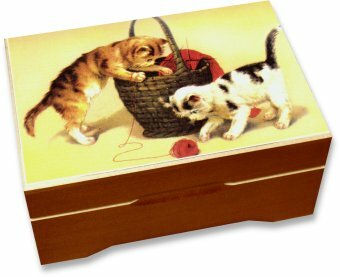 This beautiful wooden music box is made in Switzerland and has a printed picture on the lid. The clockwork 18 note musical movement is wound from underneath and when the lid is lifted plays "Romance" (Beethoven). 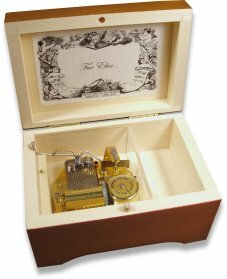 IMPORTANT NOTICE - Please be aware that music boxes do contain small parts and a removable metal key. Therefore, they should never be considered suitable for very small children or babies. Children should be supervised. If you are unsure about suitability, please telephone and ask one of our staff for guidance.